“The ACS723 is a handy little current sensor from Allegro MicroSystems for low to moderate current sensing applications. SparkFun offers two flavors of breakout board, one with just the sensor and another with an on-board amplifier to increase the sensitivity. The ACS723 sensor uses a Hall effect sensor to output a voltage relative to the current flowing through the IP+ and IP- pins. 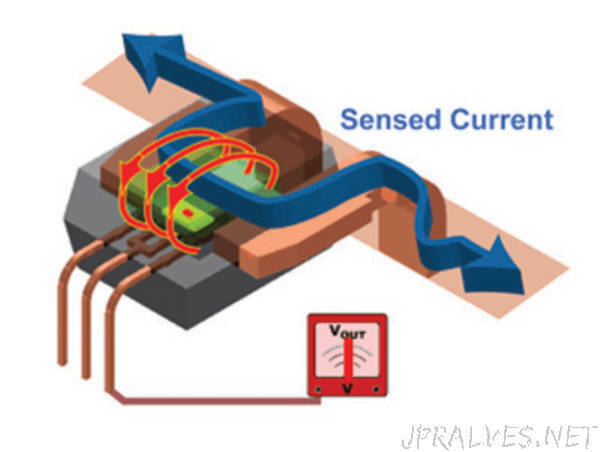 The advantage of using a Hall effect sensor is that the circuit being sensed and the circuit reading the sensor are electrically isolated. This means that, although your Arduino is running on 5V, the sensed circuit can be operating at higher DC or AC voltages!